VertaseFLI was engaged by Balfour Beatty Mott MacDonald to undertake remediation works resulting from a significant diesel spill at a Highways Authority maintenance depot / compound. Previous remediation work undertaken by others consisted of excavating to approx 4.5m deep and filling the void with compost. This has over the years proved unsuccessful and following water monitoring, VertaseFLI took the current works to a maximum 7.5m over an extended area. Because of the restricted space and the requirement for the Depot to remain fully operational, a sheet piling solution was designed and installed. Sheet piling - design, installation & removal, diversion of storm drain, super tank bracing, excavation & disposal, water treatment plant, engineered reinstatement, construction of new drainage run. 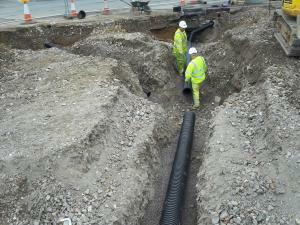 A previously unsuccessful remediation of a Highways Authority Depot (by others) resulted in the Environment Agency pursuing the clean-up of soil and groundwater from an historical diesel spill. The depth of contamination had increased to 7.5m and due to poor alluvium silt ground conditions and the Depot having to remain operational, VertaseFLI designed a sheet pile cofferdam retaining structure to facilitate the excavation, disposal and subsequent backfilling. 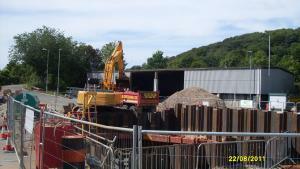 Works were undertaken on a strict timeframe to meet EA monitoring requirements. The ground conditions changed and VertaseFLI altered the design mid construction requiring 3 Super Tank Brace fames, all installed by VertaseFLI. The contaminated arising's were segregated into waste streams to minimise costs whilst maintaining a water treatment plant on site to deal with contaminated waters and free product. Imported stone was used for backfilling. A new storm sewer was installed after the cofferdam and frames were extracted.